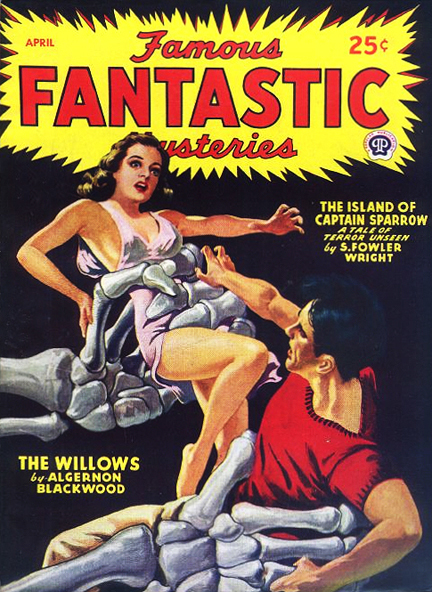 The cover story/feature article takes a detailed look at the classic Munsey and Popular Publications pulp Famous Fantastic Mysteries. Frankly, I was stuck for a lead article, but after several people commented on the FFM blog entry I posted a few weeks ago, I decided to expand it into one of the comprehensive surveys for which BnT is well known. Did you know that, of all the years in which motion pictures have been made, one far outstrips the others in the number of blood-and-thunder films released? It’s true and easily demonstrable, as you’ll see in “32 from ’32: A Banner Year for Fantastic Cinema.” The piece covers many familiar titles, but I’m betting that most of you will be introduced to must-see movies you never heard of. And all 32 films mentioned — even the scarcest, almost forgotten titles — are available on DVD. We’ll tell you where and from whom. Rick Lai is back with “The Secret Son of Bran Mak Morn,” an ingenious bit of Wold Newton-ish scholarship that draws a heretofore undetected connection between Robert E. Howard’s barbarian protagonist and other figures of fantastic literature. Our “Tricks of the Trade” department reprints a 1940 Writer’s Digest article by veteran pulpateer James W. Egan on the feasibility of pulps priced at five cents. “Cliffhanger Classics” examines the 1937 Universal serial Radio Patrol, based on a popular King Features comic strip of the Thirties. In this issue’s installment of “Adventurous Airwaves” Martin Grams Jr. tells the story behind the all-but-forgotten radio dramatization of King Kong. There are several other department installments as well. Finally, this issue’s “Blood ‘n’ Thunder Reprint” is a 1934 adventure yarn by future SF editor Sam Merwin. “The Hornet Strikes” seems to prefigure a certain crime-busting hero of Old Time Radio fame, and we think you know who we mean. All told, we think it’ll be another bang-up issue of BnT. If you’re not already a subscriber, why not go here and sign up now?